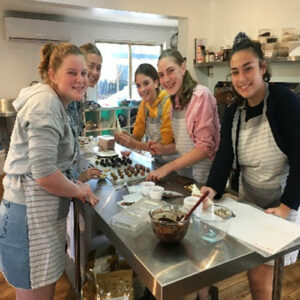 With a group of friends everyone will enjoy a fun hands-on class learning to make chocolates, in a real chocolate factory. The children will experience the magic of creating personalized chocolates with their own hands. This is an ideal party activity for kids of all ages from 8 and over. Younger kids will love the fun and magic of the tastes, smells and machines, with older high school kids getting in touch with their inner Willie Wonka and letting their imaginations run wild. The fun starts with some chocolate facts and information over a hot chocolate, followed by chocolate tasting to sample 7 different types of Belgian chocolate to allow everyone to find their sweet spot. It’s then down to business with the actual chocolate making! First the kids choose which chocolate we will use to make a ganache, fill moulds, dip the chocolates and decorate. We also get creative with pipping bags to decorate and fill chocolate lolly pop moulds, make some chocolate freckles and use some cute animal moulds.Lastly we box up their creations ready to show off when they get home. With younger kids we recommend at least one or two adults to come along to share the joy, older kids (eg high school age) sometimes prefer to do it alone, but that’s up to you.The class content and teaching style will be adjusted to suit the age of the participants. And if you’d like to share a birthday cake during the class, we can make time and space for that too.